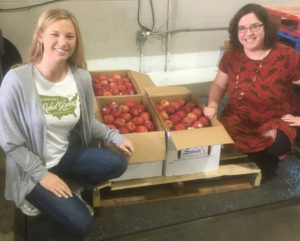 Rebel Green Fights Summer Hunger With Feeding America - Rebel Green: Eco-Friendly Products Responsibly Made in the U.S.A.
Rebel Green’s Chelsea Rotter and Emily Hare stopped over at Feeding America of Eastern Wisconsin to donate 300 apples to the fight against summer hunger. School is out. Summer is here. It’s a time when most kids can be carefree and have fun in the sun, though not all. Unfortunately, there are millions of children who go hungry during the summer. Summer is the peak season for childhood hunger since school is out of session and national lunch programs are too. At Rebel Green, we’re helping to fight hunger by donating thousands of healthy fruits and veggies throughout the summer, providing healthy snacks to hungry kids. 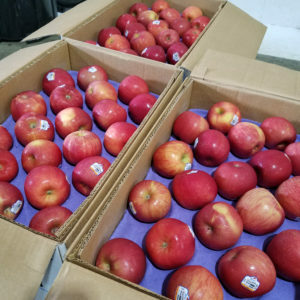 On June 12, we made our first donation, dropping off 300 apples at Feeding America Eastern Wisconsin in Milwaukee, Wis. This is the second-straight year Rebel Green is participating in the Feeding America Summer Food Program. A live recording of the donation can be viewed on the Rebel Green Facebook page as well as on Feeding America’s social media channels. During the school year, there are 22 million children who receive free or reduced-priced meals through the National School Lunch Program in the U.S. Once the school year ends, only 3.9 million receive free or reduced-price meals through the USDA Summer Food Service Program. Feeding America uses its nationwide network of food banks to help close this gap. Our donation of apples weighed about 122 pounds! That’s a whole lot of healthy snacks for kids who might otherwise go hungry. By running several summer food service programs throughout the summer, Feeding America provides nutritious meals and snacks to low-income families who face hunger in the summer. Last year, the Feeding America network served 5.7 million meals to more than 178,000 hungry children through the Summer Food Service Program. Rebel Green donates a portion of its sales to Clean Air, Clean Food and Clean Water initiatives, so every purchase of Rebel Green products helps support these causes. Rebel Green eco-friendly cleaning products are available for purchase on Amazon.com, Target.com, LuckyVitamin.com, and in select retailers nationwide. For more information on the social causes we support, visit our Giving Back page. For more information on the Feeding America Summer Food Program, and to learn ways that you can help, visit www.feedingamerica.org. Rebel Green is a line of natural cleaning products that is dedicated to providing customers a safer choice both inside the home and in the environment. Motivated by the knowledge that the products we choose to clean our homes have a ripple effect on the world, Rebel Green is committed to creating a product line that’s sustainable, natural and crafted with concern for the planet on the frontline. Founded by Ali Florsheim and Melina Marcus in 2008, Rebel Green is a certified Woman Owned Small Business headquartered in Milwaukee, WI. For more information, visit www.RebelGreen.com.